Home > BEST BATES > Do the Movies Have a Future? Simon & Schuster. Hardcover. 1416599479 Used Good: Minor shelf wear . Good. In the second decade of the twenty-first century, the movies, once AmericaâÈçs primary popular art form, have become an endangered species. Do the Movies Have a Future? is a rousing and witty call to arms. 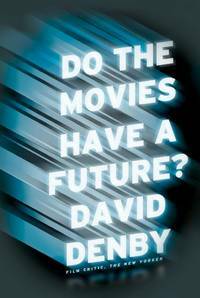 In these sharp and engaging essays and reviews, New Yorker movie critic David Denby weighs in on the frenzied, weightless action spectacles that dominate the worldâÈçs attention and celebrates the films that re-affirm the importance of the movies in our national conversation. He assesses the triumphs and failures of legendary auteurs, examines the changing nature of stardom, and re-creates the excitement of reading filmâÈçs finest critics. Wry, passionate, and incisive, Do the Movies Have a Future? is an essential guide for movie-lovers looking for ammunition and hope. Title: Do the Movies Have a Future?